Welcome to our April challenge! Autumn here to hostess our journey this month, where we're traveling down a Rusty and Crusty road! Many of us love rust and enjoy looking for new ways to get that authentic look of crusty peeling metal. 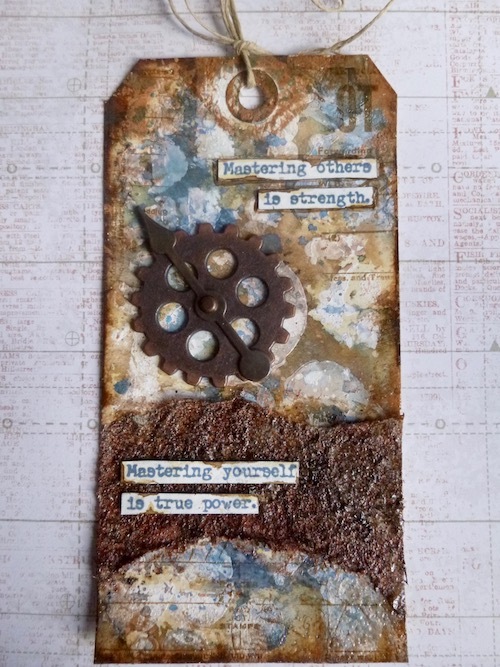 For this challenge include some rust in your vintage, shabby, mixed media, art journaling, industrial, timeworn or steampunk project, whether it be the real thing, a faux technique or just a rust colour on your project. Now onto our Creative Guides and their inspiring work. Make sure to click each link for more details. Well this challenge was 'right up my street'! 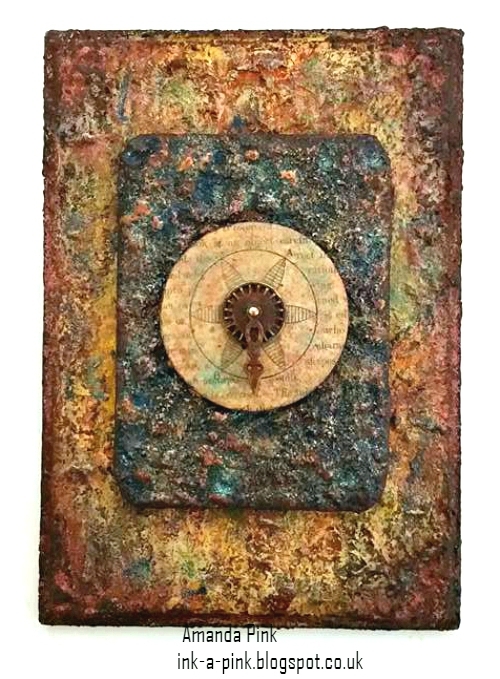 I have used a variety of mediums including Seth Apter / Emerald Creek Baked Texture Embossing powder on this wooden panel to create my rust effects. I encourage you to visit Addicted to Art for some close ups of the texture! 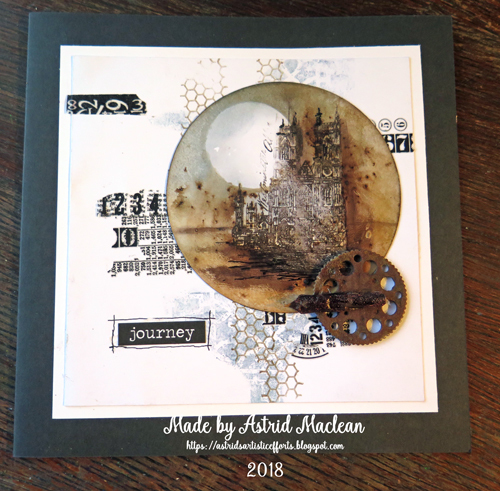 I decided to keep my project for Autumn's wonderful theme clean(ish) and simple(ish) at least for me and created a masculine card with a rusty background and some crusty embellishments. If you want to see more, please come over to my blog. Well I know I got the rusty and crusty in here lol. 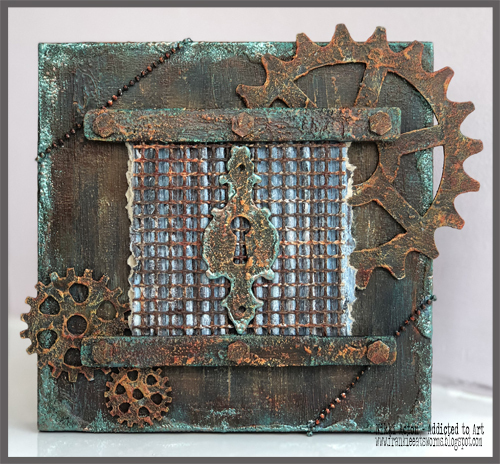 I have created a very textured piece using different ways to create the rusty effects and would love it if you popped over to see me at Bumblebees and Butterflies to see how this came together. Thanks Autumn for a great theme. I didn't expect to be joining in this month, but I'm so happy I found time to play along with Autumn's fantastic Rusty & Crusty theme. 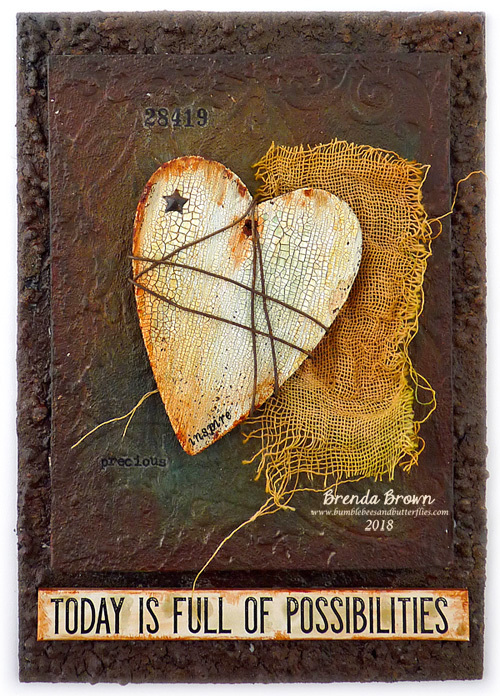 Even with only my travelling stash - augmented by my newly arrived Baked Textures powders - I was able to get some good old rusty decay going on this tag. If you'd like to see more, do come and visit me at Words and Pictures. I have been in my 'happy place' using texture paste, paints and baked textures to create an 'art panel' that is rich in texture, dimension, colour and rusty tones. There are more details and 'close ups' on my blog if you fancy stopping by. Oh how I love rust! For Autumn's fab Rusty and Crusty challenge theme, I decided to make a mini techniques journal as a quick reference for all of those faux rusting techniques that we love to use. I've some step outs pictures on my blog on how it came together, hope you can pop by for my how to. 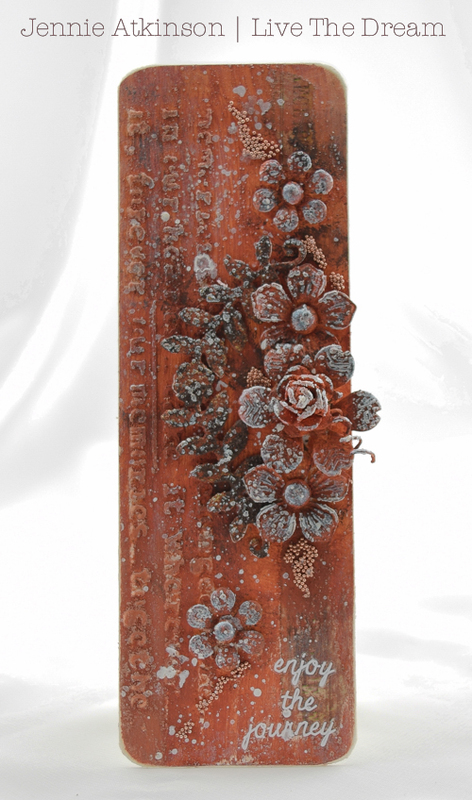 What better opportunity than our current challenge to experiment with some new rusty texture pastes! I had no idea how this would turn out and how the pastes and other mediums would work together, but I did enjoy the journey! Do join me over on my blog if you would like to find out more. Autumn's challenge theme was very timely as, after taking a couple of classes with Seth recently, I fell in love with his monoprint technique and I used it to create my rusty background. You can see more over on my blog. I had a wild idea to create a "crack" in a canvas and have flowers emerge from a rusty surrounding, and it came together just as planned - oh happy day! 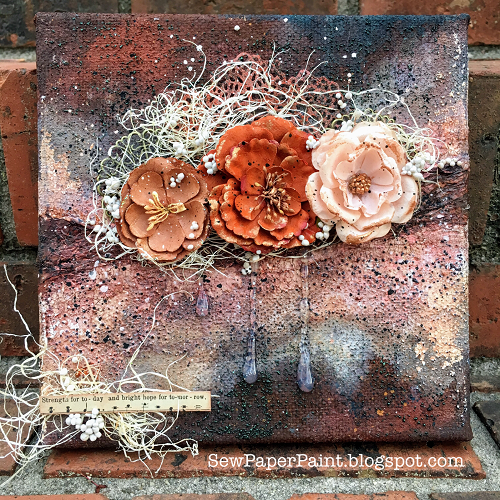 See the transformation of this canvas at SewPaperPaint. We can't wait to see your Rusty and Crusty creations! Our format has changed a bit, so make sure to read THIS post for more details. Share your project permalink below and check back next Friday for our March winner's post. 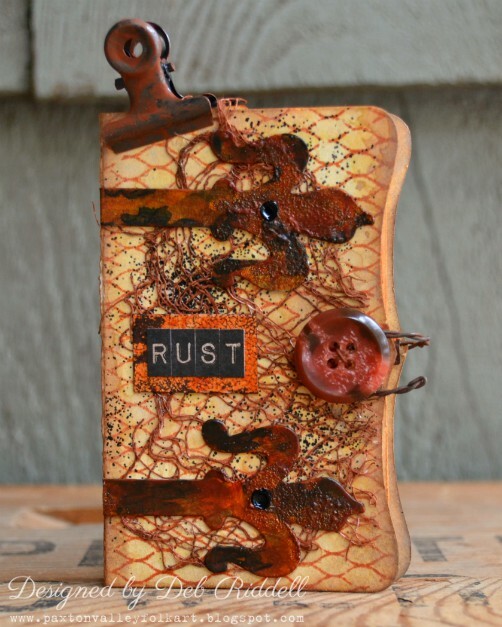 ooh I love all your rusty projects, they all look amazing! So many fabulous variations of 'rusty crusty' creativity, ladies. An absolute feast for the eyes. Looking forward to doing the rounds to delight in the detail . This was such a great theme Autumn and I just LOVE all the projects from my talented teamies!! Love this challenge theme, and so sorry I couldn't play along! But ladies, you have made me proud with your beautiful rusty creations! I can't wait to see each of them up close on your blogs! Hugs! My favorite theme - rust! Terrific inspiration from the DT! Such amazing projects! Love this theme.